Bags and buckets have two jobs. 1) to make transporting your tools and equipment easier and 2) to protect those tools and equipment while being transported. 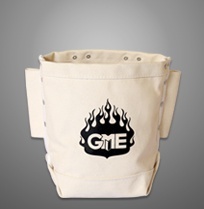 Our history in at-height, industry, and construction has allowed GME Supply to source a collection of the best bags and buckets for any situation. Whether you need a canvas bucket, equipment/duffel bags, organizers, outdoor packs, tool pouches or rope bags - we’ve got the gear you need to get the job done. Canvas buckets are perfect for hauling tools, shackles, and other small accessories around a job site and while working at-height. The canvas composition is stronger than traditional bags and ensures that your buckets are up to snuff. They also have the feature of being lighter than plastic buckets which can make all the difference when you’re climbing or walking all day. The general premise of canvas buckets are all the same, however, there are some important things to consider when picking your canvas bucket. Points to consider include whether or not you need the bucket to have specific certifications. Does the bucket need to be flame resistant or chemical resistant? What type of handle should it have - canvas or rope? Do you need attachment points and how many? Do you require a top? What about space and additional compartments? These are all questions that will affect your bucket choice. Don’t worry, we’ve got a bucket for everyone no matter how you answered the questions above. For more information on how to pick the right bucket and some details about how to know which features are right for you, check out our blog post here. Canvas buckets are great to haul tools, shackles, and other small accessories around with you at the job site. But, they aren’t built to easily transport your full gear setup from job site to job site. That’s where equipment & duffel bags come in. 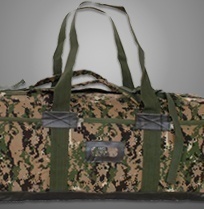 Equipment duffel bags can be made of polyester and a range of other material (including canvas) and have been specifically designed to help you get your gear where you need it to be. Our wide variety of duffel bags ensures that we have a bag to fit your needs, no matter the situation. Whether you are looking for a large bag with straps, a bag with wheels, bags made of canvas, or bags that are waterproof, we’ve got you covered. 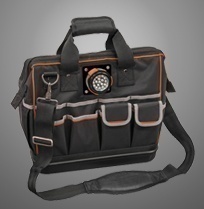 Need a bag with several compartments so you can keep your gear organized and access it easily? We’ve got those too. With so many different bag selections, it can be hard to find a starting point. That’s why we put together this blog post meant to help you pick the perfect bag. Staying organized is an important part of staying efficient and safe on the job. 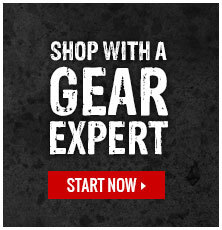 Not to mention that not being able to find the tool or gear you need when you need it can be frustrating. That’s where our selection of organizers come in. Our organizer category is pretty diverse and pulls inspiration from many of our other bag & bucket categories. Some things to consider when picking out the perfect organizer include specific certifications. Does the organizer need to be flame resistant or chemical resistant? Do you need attachment points and how many? Can it be open or closed? Do the material, weight, and available pockets, meet your needs? Is your organizer going to be heavy and difficult to carry? If so, then maybe something with wheels would be better suited for your needs. The outdoors. Whether you spend your work days or your free time out in the elements, it’s no secret that mother nature has a mind of her own. Outdoor packs have been specifically developed for the elements and holding up in tough jobs. Our selection of cargo bags and backpacks are perfect for transporting gear in a whole slew of environments. Rope is an important part of every at-height worker’s setup. In many cases, it is literally your lifeline. But, it’s not always the easiest piece of gear to transport. On top of being difficult to transport, it can easily get tangled and add unnecessary work to your day. Imagine getting to your job location ready to get the day started, only to have to spend an hour sorting through your rope. Once you sort through it, you realize it got cut during transportation. Now, not only did you waste an hour of your morning, but you have to find a replacement rope. For more information about our selection of bags and buckets, or if you have any questions you can click here to contact one of our Gear Experts®.